The Downtown Akron Vision and Redevelopment Plan will work with the Akron community to create a common vision for Downtown. Through an extensive public process involving stakeholders, community leaders, and Akron residents, the plan will create an actionable and strategic framework to shape the future of our downtown. 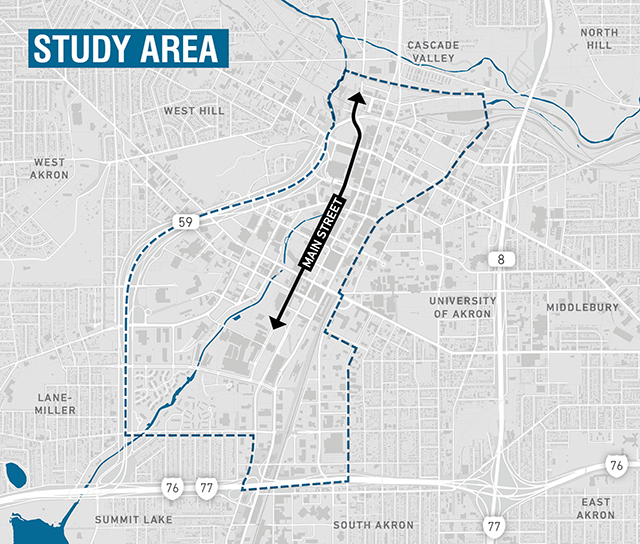 For planning purposes, this study uses the official downtown boundary established by the city of Akron Department of Planning and Urban Development as the study area. Nonetheless, this plan will look at downtown from a holistic perspective, understating that downtown’s edges and connections to surrounding neighborhoods are vital to future success and growth. 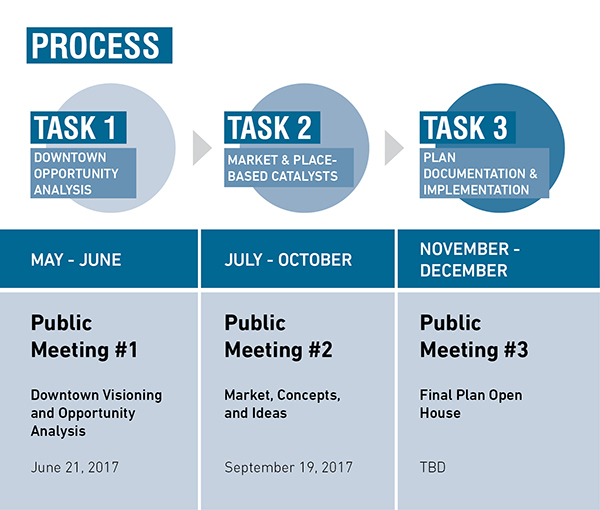 The eight-month planning process for the plan is divided into three general tasks, each with a public meeting that is open to the entire community. Task 1 focuses on analyzing existing conditions and engaging the community for their vision and feedback. In Task 2, the planning team will use this knowledge to develop catalytic site development concepts and strategies, to be presented to the public through a public meeting in September. Task 3 will refine these concepts and develop a draft plan that will be unveiled in a third public meeting, the date of which will be determined in the upcoming months. In 2016, Downtown Akron Partnership and the city of Akron embarked on the development of a long-range plan for downtown for the first time in DAP’s history. From the beginning, the plan was supported by Mayor Dan Horrigan, whose Blue Ribbon Task Force saw the need for such a plan. Phase I of the Downtown Vision and Redevelopment Plan was supported by the John S. and James L. Knight Foundation and GAR Foundation. This first phase of the process integrated more than 150 citizens and stakeholders in a five month planning process. Phase 2 is currently underway, and is outlined in the Process section above. Click here for the Executive Summary outlining the core planning principles and recommendations.